Whether it's excess housing inventory in the U.S. or financial markets awash with cheap money, investors seem to encounter stories about gluts everywhere they go. In the developed world, an ugly popping of a housing bubble, with governments scrambling to clean up the mess, has been the dominant theme for the past few years. But the developing world, where populations are growing wealthier and healthier, is dealing with the exact opposite problem. Shortages of critical items -- like food -- are sending prices soaring and leading to perilous social unrest. Investors should note that such stories now generating headlines are merely the first of many over the coming years. A severe drought in Russia that led to sharp falls in wheat production and a subsequent yearlong ban on wheat exports is the latest shock to send food prices spiking. Riots broke out in Mozambique, where bread prices have jumped 30%, leaving seven dead and 280 injured as the U.N.'s Food and Agriculture Organisation (FAO) called an emergency meeting to address the shortage. Prices of food items such as meat are already hitting 20-year highs according to the FAO. But a disastrous crop in Russia is just adding more stress on a world food supply already under hefty pressure by booming world population growth. 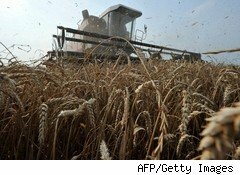 Russia is the world's third-largest grain producer and was expected to take the top spot by 2017, according to estimates by the U.S. Department of Agriculture. But the record drought has wiped out one-third of Russia's grain harvest and threatens its production ability in the intermediate term, Eurasia Group, geopolitical risk consultancy, wrote in a note to clients on Sept. 2. Moreover, Russia's agricultural minister "warned recently that dry weather might hit the usually bountiful winter harvest as well, meaning that at least through the summer of 2011, Russia will be concerned about its ability to meet domestic demand as well as export obligations," Eurasia Group analysts wrote. The shortfall in wheat amid booming global demand has made a big impact in financial markets. The PowerShares DB Agriculture exchange-traded fund -- in which wheat acounts for 12.5% of the index -- have posted big gains in recent months. Investors also see major deals like BHP Billiton's (BHP)$40 billion hostile bid for fertilizer maker Potash (POT) as a play on surging global food demand. Indeed, expanding populations that tend to shift to more resource-intensive food products are fueling agricultural demand, according to some major investors. In a presentation last year, hedge fund Passport Capital noted that world population "is predicted to increase by more than one-third, to a staggering 9 billion people by 2054." "We believe the circumstances of the current global recession -- including tight credit and reduced asset values -- have created a particularly attractive entry point for investors in the agriculture industry," the firm noted in a prediction that turned out to be ahead of the curve. Jarring developments like debt crises tend to drown out longer-term, continual processes like population growth. But investors should note that over the long haul, the latter can be far more meaningful.